Personal budgeting is a skill you want to master for your own financial future, no matter whether you change careers or not. 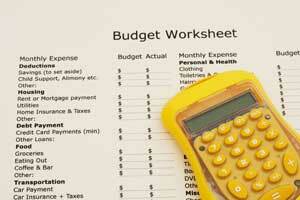 Using a personal budget you can put aside a certain amount of money for expected or unexpected expenses. This financial plan allows you to use your financial resources efficiently while reaching career goals. Money budgeting is about outlining financial goals and allocating funds into monthly spending priority. I will show you the process of developing a budget. You can use it for preventing substantial money issues while managing your career transition. A budget is a money plan, outlining your financial goals. In the financial plan you estimate your monthly expenses based on unavoidable previous expenses and bills. If you have a budget, you can set your financial objectives and regulate funds to achieve them. You may want to put your finances on a diet and save some money for specific training and education as laid out in your career plan. This means a lifestyle adjustment for reducing monthly expenses or creating other incomes. This way you can save a certain amount of money every month until your reach the financial goal. Budgeting is more about changing lifestyle or habits rather than a mere money allocation issue. This starts with realizing which short term sacrifices you are willing to accept. Then make sure your budget works to achieve your major medium or long term career goals. Your budgeting process will start with previous months’ list of monthly expenses. You can sort out unnecessary expenses from the list by knowing your needs and wants. List of expenses that satisfy your wants are something you want to sacrifice because mostly you can live without the spending. If you develop the budget with your spouse or other family members accommodate their spending patterns too. This coordination helps make sure that all family members have the same level of commitment to the achievement of your financial goals. By defining fixed expenses like car payments, home rental, and others you can learn where your funds are going. The balance that remained after fixed costs can now be your budget in the household. Rather than allocating money for miscellaneous like gas, clothing, and groceries, you can instead use percentages of it. Creating a personal budget is vital to your success to becoming prudent. Your attitude is essential because it all involves a lot of sacrifice. Slowly you’ll know how to list your earnings and overheads and the difference between luxuries and necessities. And once you practice frugality you will experience a less-stressful career transition. Personal budgeting incorporates your source of income, lifestyle, spending habits, cost of living, and other loans. You can use it to formulate goals and plans then discipline yourself to stick to it. With less money issues along the road you can focus on searching your best career. So consider personal budgeting and benefit from it.